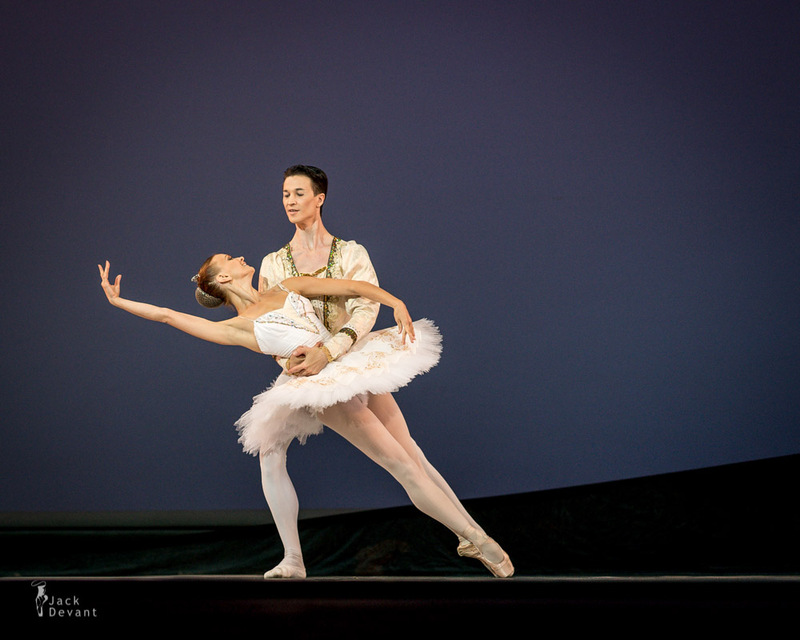 Margarita Demjanoka and Sergei Neikshin, Sleeping Beauty pas de deux at IBBC 2013 as honorary guest dancers, Latvian National Ballet. Margarita Demjanoka graduated in 1996 from the Riga Choreography High School, class of Regīna Kaupuža. She became a member of the Latvian National Opera (LNO) Ballet Company in 1996, and the Principal Dancer in 2000. She has participated in several inernational competitions including Vaganova Prix, Arabesque (2001, Perm) and Nuriev – 2000 (Budapest). She was awarded the Latvian Theatre Award as the Best Dancer of the Year (2003), Annual Aldaris International Award (2003), Latvian Great Music Award (2003), and Latvijas Gāze Annual Award as the Best Dancer of the Year (2008). Sergei Neikshin graduated in 1994 from the Novosibirsk State Choreography School, class of Vladimir Vladimirov. He was engaged at the Yekaterinburg Opera and Ballet Theatre (1994-1999) and Yuri Grigorovich Ballet (1999-2000). He is a member of the Latvian National Opera (LNO) Ballet Company from 2000. He has participated in All-Russian Ballet Competition (1994, 2nd place). He was Participant of the European New Ballet (1996, 1998). and held the title of the Young Dancer (Russia, Yekaterinburg, 1997, 1999). He is a laureate of Latvijas Gāze Annual Award as the Best Dancer of the Year (2006). The Sleeping Beauty (Russian: Спящая красавица) is a ballet in a prologue and three acts, first performed in 1890. The music was by Pyotr Tchaikovsky. The score was completed in 1889, and is the second of his three ballets. The original scenario was conceived by Ivan Vsevolozhsky, and is based on Charles Perrault’s La Belle au bois dormant. The choreographer of the original production was Marius Petipa. The premiere performance took place at the Mariinsky Theatre in St. Petersburg in 1890.